This is the sermon I preached for the 160th anniversary of Woodford Baptist Church. Of all the judges, Gideon is one of my favourites. Most of the other judges are fairly one-dimensional characters. But with the story of Gideon we are given, not just information about his life, but insights into who he is as a person. He just seems much more human than some other people in the Bible. In Gideon I can recognize some aspects of myself, as well as other people and even churches. The truth is that our faith and trust in God is much more complex than we sometimes let on. We have little slogans, perhaps even biblical slogans, and the expectation is that will make things all better or easier. Really faith has an ebb and flow type of experience. I do not mean that in a negative way. It is the same way any relationship is. The connection between two people is alive and dynamic. So too is our relationship with God. We can be affected by circumstance in life, personality, health, concerns about loved ones and so on. In Gideon, we see a picture of that. One that we could see within ourselves and perhaps within the church. There are a number of events in the Bible that I would love be there for. One of them is Gideon’s first encounter with the angel. “The LORD is with you, O mighty man of valour!” “O mighty man of valour!” In my imagination, Gideon confusingly looks around, trying to find the person the angel was talking to. It is like when a car drives by and waves and you don’t see the face so you are afraid to wave back in case it was meant for someone else. Gideon’s confusion is understandable. Let us look at that statement. O mighty man of valour. Mighty requires some source of strength. There was nothing about Gideon that was strong. He didn’t have an army. He didn’t have weapons. He had nothing in his possession that could make a difference. And Gideon was certainly not courageous. Nothing in this story even hints that Gideon may be brave. So what is left? “O man.” And that is probably what Gideon was thinking. So what is going one here? God sees what no human can see, including the individuals themselves. God could see the potential of Gideon. But it wasn’t just what Gideon could do, it was God could do through him. In Gideon’s weakness, God could be mighty. In Gideon’s fear, God would bring valour. This is not unusual. This is actually God’s normal way of operating. When God called Moses, there was a long discussion as Moses tried to explain why he was unable to do it. The prophet Jeremiah felt the same way. David did not argue with God, but his family certainly did not see the potential. In fact, there is one time when God called a person who obviously had all the skills and strength needed for the job. That person was Saul, first king of Israel and he was one of the worst kings. The nation was almost completely defeated under his watch. Have you ever felt like God was calling you to do something but hesitated because of self-doubt? Listen to the words that God speaks to you. Mighty man or woman of valour. What is the name that God has for this church. The name does not come from the potential that others see in you. It comes from the potential God has for you. If God calls you mighty, you are mighty no matter how you feel. It is wonderful that God could see the potential within Gideon, but I want to go a little deeper with how he felt. Gideon talks about a number of different things in this conversation. He talks about being in the weakest clan and being the weakest in his family. He mentions being of the tribe of Manasseh. He could have thought back to Manasseh’s father Joseph, who God brought out of jail and into a place of authority over all Egypt. But I guess he did not. If we were to follow along the rest of Gideon’s story, we would see plenty of questions and doubts. Soon after, Gideon asks for two signs from God to confirm that this is what he really wanted to do. Then as God uses Gideon to defeat the Midianites, Gideon keeps question God because God was doing some strange things. What is amazing about all this is that God meets Gideon at his doubts every time. If I was God, Gideon would have been lucky to get one fleece. What I want you to see is that we are not condemned for not understanding God’s ways. God, look at the circumstances. God, look at the lack of resources. God, where are you? I’m not just getting this from the story of Gideon. Look at the first chapter of Habakkuk. Habakkuk was really disturbed with what looked like the lack of intervention on God’s part. John the Baptist, while in prison awaiting execution, sent a message with questions for Jesus. John was not sure what Jesus was doing. Jesus himself, in the garden of Gethsemane on the night before his crucifixion, called out his Father acknowledging how hard his mission was. Whether as individuals or as a church, we look at our resources and the need and see that they do not match up. We may have some important questions for God. And this is okay. God does not want us to be fake, he wants us be real. But there is a difference between being honest and falling into despair. Honesty says that there is a big challenge and we don’t know what the solution is. Despair says that our challenge is too big and we should just give up. Please note in the story that Gideon questions the whole way, but he also continues to take the next step. There is tension between the potential that God sees within us and our own questions and doubts. What brings it all together is God’s power working through us. This is definitely the case with Gideon. In fact God goes out of his way to make Gideon’s chances slimmer and slimmer by making his army smaller. God’s intention is not just to defeat the Midianites, but to show Gideon that by the end of the day, it was all God’s power. It is God’s choice to show his power. But it is up to us whether or not we are going to recognize what God has done. Gideon started well but eventually fell into worshiping other gods. He forgot what God had done. He forgot God’s power. He lost his way. What God wants for all of us is for us to walk with him daily. Each day we must invite God to work through us. Each day we must give God the glory for what he has done. The message of Jesus, the Gospel that he preached was about the kingdom of God. Seeing that kingdom spread in our communities is what Jesus has called us to do. That is not something just for the mega-churches and the superstar pastors to do. This is for this church right here. 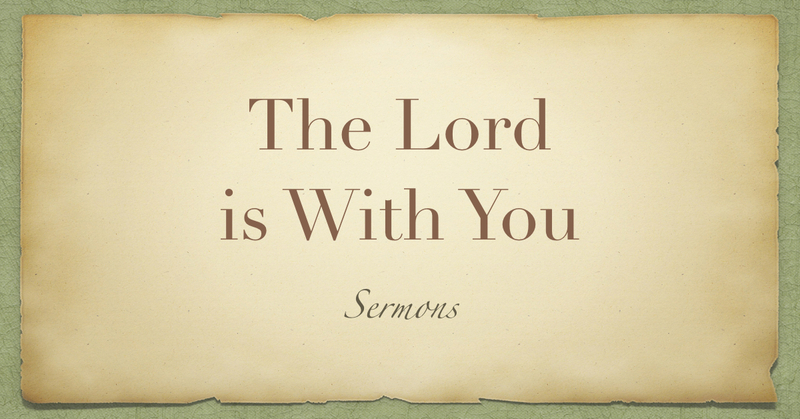 The Lord is with you. Allow God to work through you and through this church. “The LORD is with you, O mighty church of valour!” Is that what God is saying to this church? It does not matter the size of the congregation or the number of resources. God sees the potential of this church. There is something here beyond what is seen on the outside. It is okay to look around and acknowledge how that might or valour will be made manifest. But in the end, all that will matter is that the LORD is with you. And if the LORD is with you, you will fulfill your mission as you stay obedient day by day.